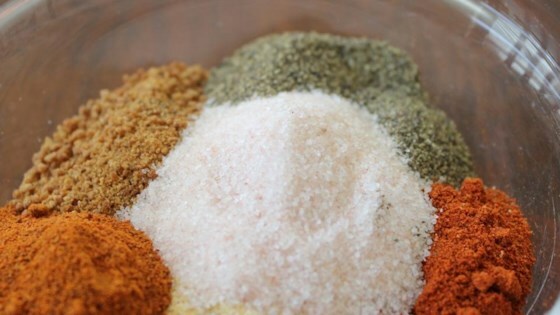 "A classic pork or chicken dry rub that is very popular in Southern Georgia. This is enough to coat about 5 to 7 pounds of ribs or 10 pounds of pork roast or chicken. You can add more cayenne pepper by the teaspoon depending on how hot you like it." Whisk brown sugar, paprika, salt, black pepper, garlic powder, onion powder, and cayenne pepper together in a bowl. Store in an airtight container. This chicken is so easy to prepare, so incredibly delicious to eat. Season meat with dry rub and let sit for 30 to 45 minutes before grilling or smoking the meat. Spicy, i didn't but next time i would but back on the salt. Very yummy over all, put on grilled chicken and it was great! My husband loved this rub! He declared it delicious :) I used coconut sugar in place of brown, which worked out great! Cut back on the salt some. Fantastic!!! Used this on a pork rib loin roast. Turned out moist and oh so tasty!! Saving this recipe to be used many more times!! I made this. It was awesome. Although my family does not like hot stuff, so I cut down the cayenne to 1 teaspoon and the black pepper to 1 tablespoon. It had just the right kick. I made the rub and added a little oil to marinate my chicken thighs over night in the fridge. The chicken really soaked up the flavor and turned out great!